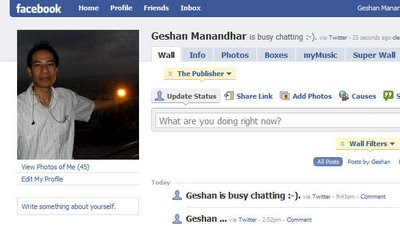 Social Network(s): Connecting with friends was never so easy, I guess you might have multiple accounts at social networing sites like Facebook, Hi5, My Space, Orkut to name some. But on the contrary the photo comments seems like personal e-mails and the wall or message board also seems to have things everyone should not know. Anyways you can build you web presense with some social networks for me I like Facebook, who doesn’t its like your Generation Y identity these days, and yes it also has a cool badge to show off. A Blog: typically is a reverse chronological record of posts. Initially used as a online dairy but now people blog for various reasons. You might have a portfolio site but a blog is a must if you want to show you are Web 2.0 aware. For blogging there are many options like blogger, wordpress, typepad etc or you can host your own blog with wordpress or any CMS or a self made blogging system. Let the world know what you feel, start your blog today. 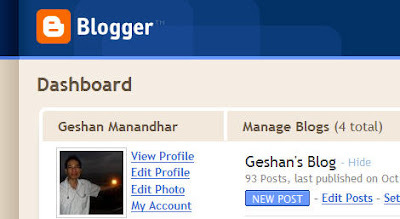 Find here, the state of blogosphere as showcased by Technorati. It is a must for every blogger or a wanna be blogger :-). Registering a blog is not a big deal, updating it regularly is one. 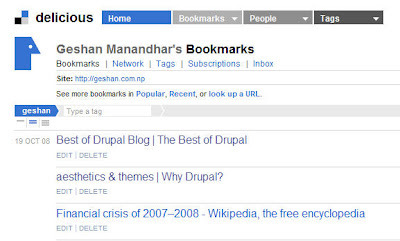 Social Bookmarking: This might be new area to explore if you are not familiar with names like Digg, Delicious and Stumble Upon to remember some. The simple idea is you bookmark the pages you like or want to see later on the web not the browser you are using and access it from any device anytime. You also share with all the users of a network as you have your own URL where you show all the links you save. I use delicious and I like it, for better use of these sites use the add-on tool bar that give easy accessibility delicious is the best in this regard, you can find the Firefox delicious toolbar here. Delicious also has a badge to show in your site or profiles. Micro Blogging: is the new wave in current web trends. After the advent and soaring popularity of Twitter, micro blogging has touched new heights. Mainly answering your current status or “What are you doing right now?” question due to easy of use and only 140 character limit, it has been used to maximum limits. More about micro-blogging here at Wikipedia. With the boom of twitter and its endless forms of use there are other twitter like applications but not as successful as twitter. Another thing is the API like that of Facebook which allows many different 3rd party to collect links, display stats etc of a twitter account. If you want to be cool use Twitter. Twitter is the coolest, its badge is also cool showing your latest tweets. 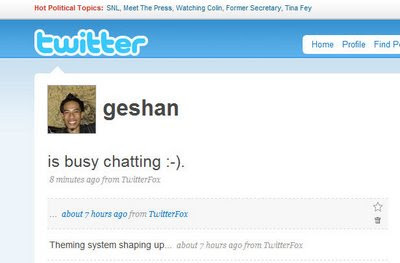 You can tweet directly from your Firefox using TwitterFox add-on. Other twitter like services are Pownce, Plurk to name some. 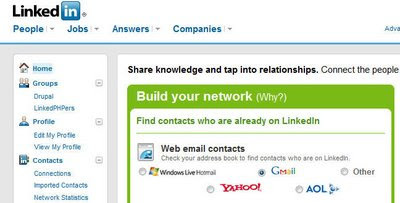 Professional Profile: Last but not the least, if youare professional then show off your connections, get recommendations, search for new opportunites at Linked In. With linked in you can link in with other professionals, join groups of concentrated discussion and learn more. Its similar to having like minded professionals on the web, fun to be a part of. Other than that I would suggest to subscribe all your RSS feed at Google Reader, so that you catch up with all the happenings at real time. Creating accounts on all above 5 sites will also depend on the time you spend on the web. If blogging demands more time discard it. Hope to see your web presence assembled and then enhanced in a smooth way.